If you're in between sizes, your waist measurements determine the right size, as the dress is the most tight in this area. 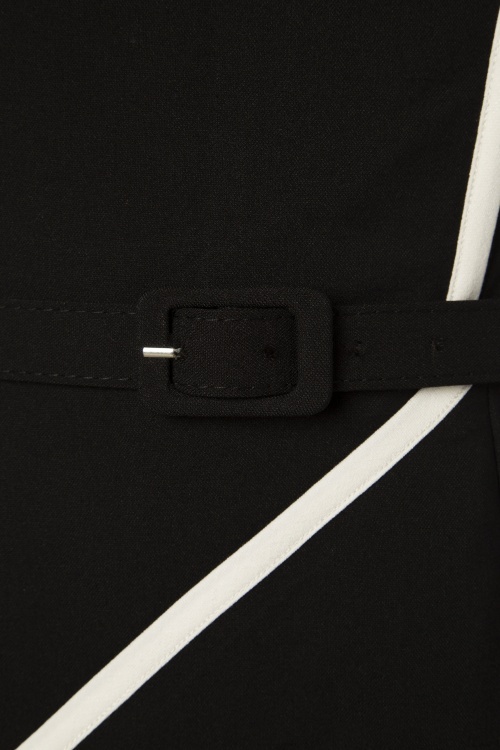 The fabric has a light stretch but the waist band doesn't stretch. These are English sizes. When you measure yourself, consult this size guide and consider our possibly mentioned TIP!, you will be 99% sure of the right size in this skirt. 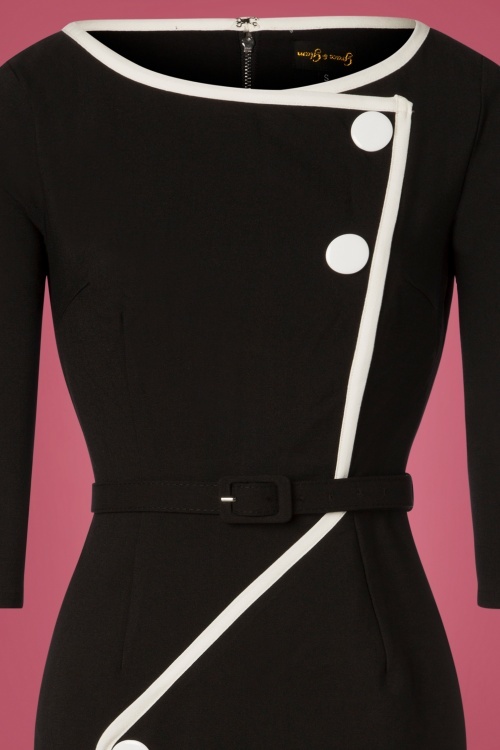 This 60s Spotlight Pencil Dress in Black is so Jackie O.! Super classy but the black/white contrast adds a real sixties twist. A charming high neckline, flattering 3/4 sleeves, striking decorative buttons in white and a detachable belt to accentuate your waist. Made of a firm, yet supple, black fabric with a light stretch and fully lined so she kisses your curves without marking any problem areas. She definitely lives up to her name; you're guaranteed to steal the spotlight in this beauty! I received this yesterday as a Christmas present from my boyfriend...let me tell you, if you buy one thing from Top Vintage, this is a must have! I've been complimented all day and the fit is bang on! I have a pretty large chest (38 DD) with a much smaller waist and the medium fit perfectly. It falls to below my knees and is warm. Love, love, love it!!! Ein tolles Kleid und schöner Stoff. Es ist weich und sitzt bei meinem F-Körbchen, schmaler Taille und F-Hüfte :-) einfach nur schön. Ich werde der Hingucker auf unserer Jahresveranstaltung sein. Wie mit allen euren Kleidern. Und der Armreif passt perfekt dazu.